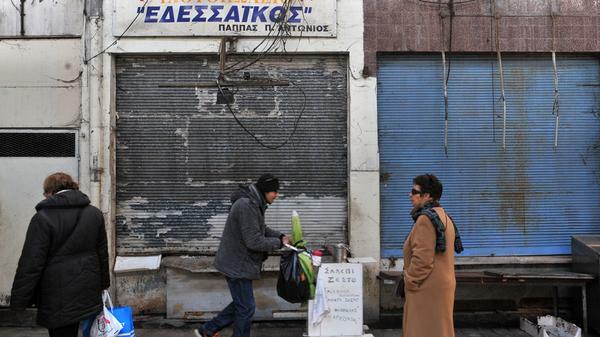 People walk by closed shops in Thessaloniki in March. Greece, though it has once again averted bankruptcy, is still struggling economically. For many countries, the worst of the Great Recession is over. Things aren't perfect by any stretch, but economies are growing again, employment rates are up and consumers feel more optimistic, which is important. But that is not the case in Greece. In the last 48 hours, this battered country has once again averted the latest threat of bankruptcy: Somehow, Greece has found the money to pay back hundreds of millions of dollars to the IMF. But the Greek government says the coffers are now almost empty, making Europe seriously worried. This week on For The Record, we spoke with three Greeks about how they are navigating the financial crisis and how they're re-calibrated their expectations as a result. I also talked to American poet A.E. Stallings, who lives in Athens with her Greek husband and two kids. A few things stood out in those conversations. A first grade teacher, Stathis Kirillidis, told me that his students are coming to school without proper lunches, so staff members had to take up donations from hospitals and other organizations to feed the children. A 24-year-old student, Konstantina Diamani, said she feels hopeless, and that Greece just isn't a place where she thinks she can become the person she wants to be. And we spoke with an entrepreneur, Thanos Kosmidis, who is intentionally building up his newest medical technology company in Greece to try to create jobs there. But even he says if the economy doesn't start to turn around, he will leave the country before he watches his company fail. If you believe the headlines, then we're sunk. Greece downgraded deeper into junk. Stash cash beneath the mattress, pack the trunk. Will drachmas creep where Euros fear to tread? A crisis that lasts for years?--call it a funk. Austerity starves the more its maw is fed. The right, the left; the blue, the green, the red. Caryatids, gone on strike, sit down instead. We'll hawk the Parthenon to buy our bread. MARTIN: And this is For The Record. For many countries, the worst of the great recession is over. Things aren't perfect by any stretch, but economies are growing again. Employment rates are up and consumers feel more optimistic, which is important. That is not the case in Greece. In the last 48 hours, this battered country appears to have once again averted bankruptcy. Somehow, Greece has found money to pay back hundreds of millions of dollars to the IMF by an April 9 deadline. But the Greek government says the coffers are now almost empty and Europe is seriously worried. UNIDENTIFIED REPORTER: Why is Greece having such a hard time convincing international creditors, namely Germany, that it can get a deal done? MARTIN: Years of instability led to rioting in the streets in 2010. And ultimately, all that angst swept up in a new political party this past January, a party that promised to make everything better. Months after those elections, Greece is still on the edge of a potential disaster with global implications. For The Record today, escaping a Greek tragedy. In a moment, we'll speak with the American poet and MacArthur fellow A.E. Stallings, who's made her home in Greece. But first, we're going to introduce you to three Greeks living through the financial crisis. MARTIN: First up, graduate student Konstantina Diamanti. KONSTANTINA DIAMANTI: I live in Athens. I'm 24 years old and I'm a student. I feel that my hopes are getting lesser and lesser. MARTIN: Diamanti's thinking about leaving Greece all together, maybe going to Germany where she feels she'll have more opportunities. DIAMANTI: It will be difficult. I don't believe in utopias and I don't believe it's going to be a paradise there. But, I certainly hope for something better. STATHIS KIRILLIDIS: My name is Stathis Kirillidis. I am a school teacher at an elementary school in Athens. MARTIN: Kirillidis went into teaching because it's a stable government job. Not anymore. A couple years ago, he saw his paycheck cut by 20 percent. At the same time, he finds himself shelling out more money to buy school supplies for his first grade students because the school is no longer reimbursing him for those basics. He sees his students suffering from this crisis, too. KIRILLIDIS: They don't wear proper clothes. They have old clothes, old shoes. You can see that. There is also more bullying in the classroom or outside the classroom - school violence, things like that, yeah. Luckily, we have support from hospitals that provide us with sandwiches and milk and yogurt every day. And we can give that to the children. MARTIN: I asked him if he is thinking about maybe moving out of the country, if that's even an option for him if things don't improve. KIRILLIDIS: Yes, it is. Yes. I feel really embarrassed to say that, but it's true. MARTIN: Where would you go? KIRILLIDIS: I would go to a normal country where I would like to have more political stability, social stability, things like that, you know? If you really ask me, it didn't hurt me so much, the financial problem of my personal situation, than the humiliation that my country is not able to deliver social things, political things that are for granted in other serious countries. MARTIN: So that's the view from a student, a government-employed teacher, and now, the entrepreneur. THANOS KOSMIDIS: I am Thanos Kosmidis. I live in Athens, Greece. MARTIN: That's where he's running a medical technology start-up. When the 35-year-old Kosmidis was growing up, Greece was on an upswing. The country had just joined the European Union. It was one of the weakest members, so it had a lot to gain and it was setting itself up to make the most of that partnership. KOSMIDIS: Today, things are much more worrying. MARTIN: And while Kosmidis is committed to growing his business in his home country, he is keeping his options open. KOSMIDIS: We really want to make it there in a way that there will be people that will be employed in Greece. At the same time - I will be honest with you - we will not sacrifice at all costs. If we see that Greece as a system, as a country, does not want us to grow, it's clearly not the place to be for us. MARTIN: That was Greek businessman Thanos Kosmidis, elementary school teacher Stathis Kirillidis and graduate student Konstantina Diamanti. Now to the American poet, Alicia Stallings. She lives in Athens with her Greek husband and their two kids. ALICIA STALLINGS: We live in a neighborhood called Neos Kosmos - the new world. It is a sort of working-class neighborhood but very close to the center. It's got everything you need. You can have your shoes mended, you know, there are schools there, tavernas. I think when we first moved in here, it was sort of starting to gentrify. And that has reversed - people going through the trash, you see homeless people. MARTIN: Do you hear people talking about how much responsibility that Greeks themselves bear for the current situation? STALLINGS: You do. A lot of the anger for things in Greece often would be sort of automatically put on the Americans or various other people. And I think now Greeks are very angry with their own politicians, with their own political system, with the fact that nobody seems to go to jail. The top one percent gets off scot-free. There's a lot of anger and discussion about this. MARTIN: You have turned to writing, this kind of social journalism, to record the Greek experience for an American audience. What have you found American readers to be most surprised by? STALLINGS: Sometimes there's an idea that if you are an expat living in Greece, you have this ideal life on an island and everything's like a vacation. And I think writing about the sort of nitty-gritty, you know, when there were a lot of riots dealing with tear gas and various dysfunctions, I think that has surprised people. I think I also write a lot about how poetry ends up in the political discourse and I think Americans are surprised by that. So there's, to me, a kind of interesting interaction with literature and what is happening all of the time that seems very alive, very present on the streets. MARTIN: You've got a unique viewpoint. You're an American living in Greece. You are used to observing humanity at its best and worst as a poet and through your writing. Can you help us understand your take on why Greeks are in this mess? STALLINGS: I've thought about what if something similar were happening in the States and how Greeks, I think, are taking these things sort of differently. One thing for instance, my mother-in-law - who's a very elegant, spry 83-year-old - she has, in her lifetime, she as a little girl saw the German tanks roll down Syngrou Avenue. She saw famine, people dying on the streets of hunger, civil war, the chunta (ph). So I think her perspective and a lot of older Greeks is, it could be worse, we've gone through worse. So I think there's a certain amount of resilience. MARTIN: Alicia Stallings, better known as the poet A.E. Stallings, joining us from Greece. Thanks so much for talking with us, Alicia. STALLINGS: Thank you. Transcript provided by NPR, Copyright NPR.